Earth 667C is a board game designed by the Small Business Design Center for space adventure and spaceship building fun. Create your spaceship, launch it from Earth, and travel to a new home exoplanet to save humanity. The act of designing a board game has brought me and my friends closer together, in a real world way. It harkens back to our youth, when smartphones and social media were not in the way of personal interaction. On August 10, 2015, Sagan Medvec, a website designer and entrepreneur, launched a new Kickstarter campaign for Earth 667C Spaceship Building Board Game. An unique mix of fantasy and adventure multiplayer gaming, set in the year 2087, focuses on building the fastest spaceship to carry as many survivors as possible to save humanity from solar extinction as the sun goes supernova. Be the first to do so, and win bragging rights over friends and family. 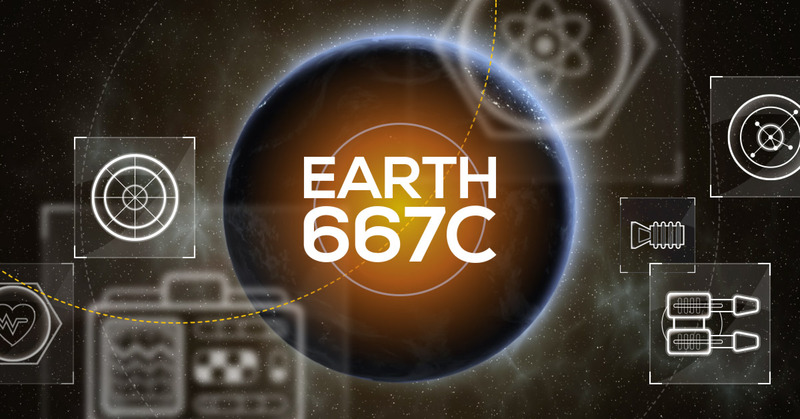 View the Kickstarter Campaign for Earth 667C. (https://www.kickstarter.com/projects/saganmedvec/earth-667c-spaceship-building-board-game). Earth 667C Spaceship Building Board Game is set in near future in 2087. The objective of the game is to build a spaceship that can be used to transport as many survivors as possible to the nearest human habitable exoplanet, Earth 667C. The game is divided into three stages each with unique and different challenges. In ship building stage, players need to build and customize ship with different accessories like food production, life support, engines, medical facilities, and more. In second stage, the fully constructed ship is launched with a roll of the die, while third stage is about journey to the humanity’s new home. The Journey is filled with it’s own obstacles, from black holes to enemy ships, that can dramatically impact the outcome of the game. The campaign will be running until Wednesday, September 9, 2015. In exchange for pledging to the project, backers are offered variety of rewards according to their contribution including nicely printed t-shirts, buttons, posters, and other goodies. Three stretch goals are defined starting from $15,000, which will add additional game play variations and promotional items. Game backers can pledge funds starting from just $1 to $1000 with increasing perks. Several of the highest level rewards include having the supporter's name and portrait included in the game, as either a captain or engineer. For more information about “Earth 667C Spaceship Building Board Game” please visit the Kickstarter page or contact Sagan Medvec. Earth 667C is a spaceship building board game currently available for backing on Kickstarter.Earth 667C Logo Game cards and elements of the Earth 667C Ship Building Board Game available now on Kickstarter.Game cards and game boards for Earth 667C.